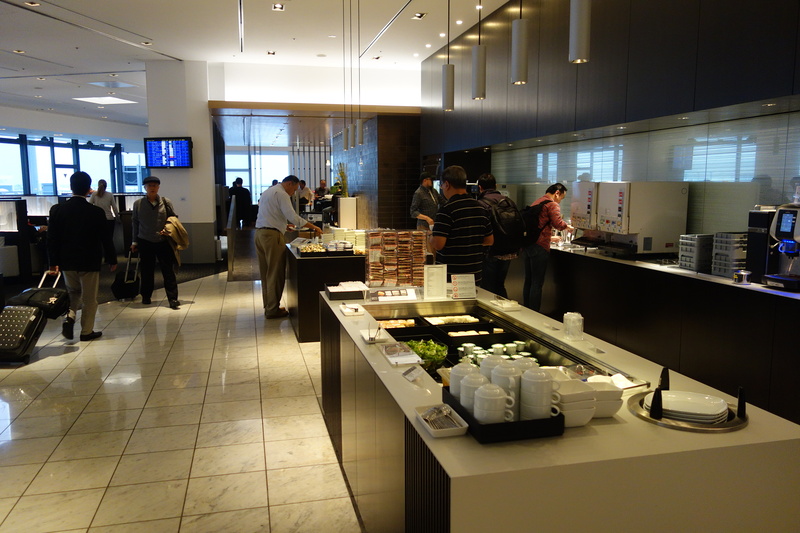 After deplaning from my previous flight and heading through the transfer security checkpoint, I was spit out right in front of the entrance to the ANA Business Class Lounge and Suite Lounge. Upon checking in, I was directed to the Suite Lounge side, but my first order of business was to grab a shower after the 14-hour flight. The showers aren’t located in either lounge, but rather they’re in a shared area to the side of the check-in area. I was immediately given a shower room and a small package with Shiseido amenities. I then made my way into the Suite Lounge. The first thing that I noticed was how crowded and busy it was for a first class lounge, as there were very few empty seats open when I arrived. A lounge attendant greeted me, saw my look of mild shock and apologized for the scarcity of open seats, and asked me to sit down where she brought me a wet towel and a drink. After this initial greeting, everything else was self service. Although I had gorged myself on my flight, I knew that I had to check out the food options and at least get a bowl of noodles. I was more than satisfied with the food choices as the noodles I had were delicious, and I enjoyed the inari and small desserts that I sampled. One of the displays advertised relaxing massage chairs, and after sitting in a massage chair in an airport lounge at Shanghai Pudong, I knew I wanted to seek these out. An attendant told me they were located in the business class lounge, so off I went. If I thought the Suite Lounge was crowded, that was nothing compared to the regular lounge. The lounge was quite large (probably 3x the size of the first class side), but nearly every seat was taken, and they were making periodic announcements to ask people to make space for other passengers. Unfortunately, this also meant that all of the massage chairs were occupied by people who were using them as regular seating, so I didn’t get my massage. In spite of how busy the lounge was, the food options also looked good particularly because there was also access to the noodle bar. Having failed in getting a massage, I returned to the Suite Lounge where I checked out the personal cubicles, which might be the place I return to next time if the general lounge area is crowded. As it was, by the time I got back to the Suite Lounge, the lounge was considerably less crowded than when I arrived, so it was a lot more peaceful. There were also some opportunities for plane spotting, including two kinds of planes that I’m planning to fly in the coming months. I think it’s also worth noting that the wifi in the lounge was too slow to use when I arrived and the lounge was super crowded, but after many people had left, I was able to use it successfully. With about 30 minutes to go before my flight, a lounge attendant came up to me to tell me that my flight was beginning to board. Impressive stuff for such a busy lounge! Although she also told me the wrong gate to go to, but that’s possibly because there had been a gate change maybe an hour before the flight. 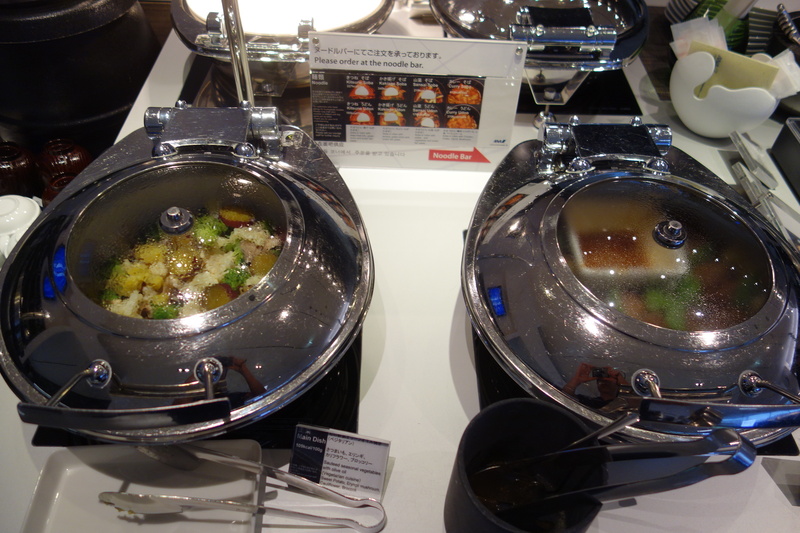 This entry was posted in ANA, Lounge Reviews, Travel, Trip Reports and tagged airport lounge, ana, tokyo narita, travel, trip report on November 11, 2013 by Edward.